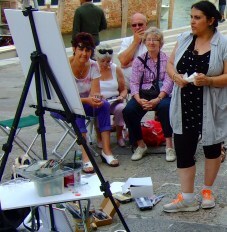 We are delighted that, following a hugely successful collaborative week teaching in Venice in 2012, West Norfolk Arts Centre have invited Soraya to tutor another of their 8-day Painting Courses – this time on the beautiful Greek Island of Skiathos, in July 2013. The Course is organised by, and bookable through, West Norfolk Arts Centre and full details about the trip appear on their website and below. Please note that if you click on West Norfolk Arts above, you will then be taken directly to their website. Join professional artist and tutor Soraya French painting in the media of your choice on the beautiful Greek Island of Skiathos. Soraya will organise a productive daily painting routine on location with demonstrations and one to one guidance as appropriate. 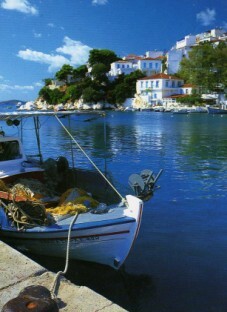 We will be painting in and around the beautiful old harbour of Skiathos Town. 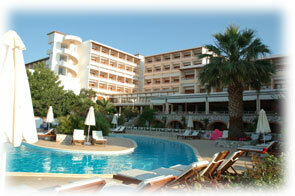 the Esperides Hotel on a dinner, bed & breakfast basis. All meals are buffet style. Accommodation is ensuite with balcony, air conditioning, hairdryer, safe & TV. There is a pool and beach bar - pool towels not provided. The hotel overlooks the golden sands of Achladies Beach and is set in beautiful gardens. Price is based on two people sharing a twin room and includes return flights from Gatwick, coach transfers and excursions. £145.00 supplement for the week for sole use of twin room. We research all our foreign trips thoroughly, checking hotels and suitable painting locations well in advance. We do not run 'an opportunity to paint along with...' trips. Unless otherwise specified, all our painting courses are tutored (by the tutor) in the morning and afternoon (eight-day courses abroad include one half day for retail therapy / relaxation). On all courses the tutor will organise a daily painting routine with demonstrations and one-to-one guidance as appropriate. Richard Cartwright will be on hand to deal with any non-painting aspects which may arise ensuring the tutor is free to provide the high standard of tuition you expect. Comprehensive travel insurance is available through Independence Travel or Travel Editions (for Provence). Please make cheques payable to Independence Travel. All travel and accommodation arrangements are being professionally organised for us by Independence Travel who are bonded tour operators (ATOL 5534-ABTA G2436). To ensure you enjoy the benefits and financial security of these bonding arrangements the contract for your painting course is with Independence Travel with West Norfolk Arts Centre acting as the agent.